When a series has been running for more than half a century, it is inevitably going to acquire a lot of baggage. Some franchises expand outwards: it turns out that Klingons and Romulans are not enough to keep life interesting, so we discover there are also Cardasians and Ferengi and Borg and Gamma Quadrants. This makes a universe which is more fun for the dedicated geek, but less accessible to the casual viewer. DC Comics shakes up the cosmic Etch-a-Sketch and starts again every couple of decades, and even Marvel has come to terms with the fact that some of the narrative crimes which have been committed against Spider-Man can be unwritten. Doctor Who has never really acquired a complicated back-story in quite that way. The history of the Daleks and the Cybermen is more or less re-invented from scratch every time they pop up. Last season's unforgivable Hell Bent made no more sense to those of us who are up to speed on Gallifreyan lore than it did to people who were completely ignorant about it. What Doctor Who does is expand inwards. The iconography stays much the same as it was in 1970 but each icon is progressively overlaid with more and more layers of symbolism. One of the amazing and wonderful things about the TARDIS is that it merges seamlessly into its surroundings wherever it lands. One of the way we know it is a broken down pile of junk is that this feature doesn’t work: it always and only looks like an obsolete English phone box. Which is part and parcel of another obvious duality: the Doctor is an ancient alien who has traveled all round the universe but at the same time he is parochially and archaically British. It really doesn’t do to think about this stuff too much. If it turned out that tea and jelly babies were simply an alien fare which the Doctor has acquired a taste for, then some of the point of them would be lost. Tea means to the Doctor what it does to the average stereotypical Brit. If it turned out that the Doctor drank tea on Earth but blogwart bloodjuice on the planet Zog then we would lose our sense that the Doctor is British. Last week, Bill wanted to know why the T.A.R.D.I.S acronym works in English if the Doctor is an alien. This week she wanted to know why the Doctor was Scottish. And of course Rose wondered why the Doctor sounded as if he came from the North. Speculate, if you must, that tea and crumpets and cricket are actually the protrusion into our dimension of an ancient Time Lord custom; say that that the Doctor comes to England because England reminds him of Gallifrey. The truth is that the Doctor is a British alien. (The Time Lords are British aliens; the Daleks are British fascists; the Cybermen are British borg.) The whole point of Doctor Who is that everywhere in time and space is forever England, just as the whole point of Star Trek is that everyone in the whole galaxy believes in the great American dream. But don't draw our attention to this, or we might stop believing it. In the very olden days, the Doctor couldn’t control the TARDIS at all, either because it was broken, or because he had somehow forgotten how it worked. Tom Baker claimed to have fitted a randomizer so that neither he nor the Time Lords knew where he was going to land next. Script Editor Robert Holmes was having none of it: according to him the Time Lords controlled the movement of the TARDIS, and always have done, even before the Time Lords had been thought of. How is this different from saying that “this old ship of mine is an aimless thing”? Both are blatantly admitting that the TARDIS is driven by the power of The Plot: the Doctor will always land where The Plot says he should land. But the old wanderer in the aimless Ship resonates differently from the lonely god in the semi-sentient vessel that knows where he needs to go. Robert Holmes retro-conceit was an admission that the TARDIS is not aimless, and never has been: it always ends up on an earth colony just before the downtrodden underclass rebel against their tyrannical insect overlords. “The still point between wanting and needing” is equally an admission that the show now less about the adventures and more about the Doctor. He will always end up in a situation where Character Development can happen. Bill wonders why the Doctor, given that he has fixed so many things about the TARDIS, doesn’t just fix its fading-into-the-background mechanism. This question was first raised as far back as the American telemovie: Doctor Paul's answer was "I like it like this". Doctor Peter's answers are equally evasive, but Bill catches him out and reveals that the shape of the TARDIS is a symbol. It is a Police Box, and the Doctor goes around fixing people’s problems, like a policeman. And on the door it says “Advice and assistance obtainable immediately”, which is what the Doctor does -- go around the universe giving people advice and assistance. Which is quite a neat observation. But it is the sort of neat observation that a fan ought to be making on a blog, not the sort of neat observation that a companion should be making in the TV series. The one thing the Prince of Denmark can never do is notice that he's speaking in iambic pentameters — and English iambic pentameters, at that. In the end, this stuff feels like pouring purple food dye in the Atlantic Ocean. If the new explanation were accepted — the Doctor chose a Police Box because it symbolized who he wanted to be; the TARDIS is a mystical being who takes the Doctor to places where she thinks he needs to go — then you've redefined Doctor Who. And there is only so far you can go from the cantankerous wanderer with the bust time machine without breaking the show. But the new explanation won't be accepted. There will be another one a long in a minute. It's like the preacher who gives a brilliantly clever allegorical interpretation of his text this week, and next week, gives and equally brilliant but entirely different allegorical interpretation of the same text. After a few weeks, you start to wonder why he bothers. Sydney Newman said that any writer who revealed the secret of Doctor Who should undercut the explanation by the end of the episode, to give other writers a chance. It seems to me that any attempt to pluck out the heart of the Doctor's mystery is now automatically undercut by the show itself. Nothing dates as fast as the future. Remember Four To Doomsday, where everyone spoke in hushed tones about something called a “silicon chip”, or even The War Machines where someone had developed a computer so powerful that it could do four figure square roots in mere seconds? Even that moment in End of the World where Cassandra mistakes a wurlitzer for an I-pod is starting to look distinctly of its time. This week's story is based heavily around the emoji fad: and it was looking out of date before it had even been transmitted. The idea of putting tiny little pictures into you emails may turn out to this month’s craze; or it may turn out to be a whole new form of media that will swing the result of the 2024 elections. Back in the days of Usenet, there were people who thought that typing ":)" after a joke presaged the end of human literacy, if not human civilization; but most of us could see that there was a need for some new punctuation marks to indicate expression and tone of voice. But for a long time I could see no purpose at all in text messages. Why on earth would I send a telegram when I had my own personal walkie-talkie in my pocket at all times? Nowadays my phone, like everyone else's is primarily an SMS device, and I am quite taken aback when someone wants to speak words to me in their voice. Everything from Thunderbirds to Cold Comfort Farm predicted that, in the Future, everyone would talk to everyone else on videophones. Now I really have a perfectly functional videophone in my pocket, I mostly talk in teeny tiny telegrams. All the great historical events of our lives present themselves to us, not as solemn announcements on Radio 4, but as 140 character tweets. "Trump starts nuclear war. Bye! #bunker" “Queen Dead. Charles King. #sad”. So it's quite possible that eighteen months from now I won't know how I ever managed without emojis. There is probably a good story to be told about the emoji phenomenon. What would the world be like if picture language — hieroglyphics — replaced ordinary text or indeed ordinary speech as the primary form of communication, and therefore as the primary form of thought? Presumably, the young people's picture language would develop its own grammar and its own poetry -- just like British and American sign language -- and presumably that would be very different from the old people's written language. I am very nearly 35 and even I can see that half the fun of emojis is cleverly putting two or three symbols together in a way that your friend will understand but other people might not. The digital natives are probably doing much cleverer things which haven't filtered down to me yet. Could we eventually end up with two generations -- even two species -- who simply cannot talk to reach other? Remember that episode of Star Trek The Next Generation where the aliens communicated only in allegory? But Smile is not that story. I am not even sure if the writer quite understands what an emoji is. The Doctor and Bill have to explore a Big Dumb Object, an empty white city populated by little chumblies with TV screens for heads. They communicate by showing different smiley faces on their screens. They give the Doctor and Bill little badges which also display happy and sad faces depending on their mood. They have to wear the badges on their backs, so they can’t ever know what mood is being displayed. If one of the badges ever turns "sad", the person wearing it will be eaten by a school of microscopic robot piranhas and used as fertilizer by the chumblies. What has happened, as usual, is that the robots have interpreted their orders to keep humans happy too literally, and simply killed everyone who wasn’t. This has created an epidemic, because whenever a human being was killed, the human beings around him became even sadder and had to be killed as well. So not, in fact, a story about emojis at all, even if we keep referring to the chumblies as Emojibots. 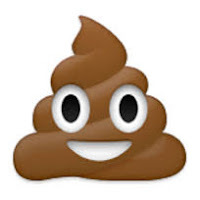 Emojis are little pictures of cups of tea and hearts and bunnies and turds which young people use in text messages. What this story is about is emoticons -- little representations of happy and sad faces which everyone has been using for decades. Possible, like me, Cottrell-Boyce thought that emoji meant "picture representing an emotion" where actually it is simply Japanese for picture-character. If this isn't about emojis then what is it about? Nothing very much at all, so far as I can tell. Some of the banter is quite fun, and I was amused by the blue jelly food substitute. But there is nothing to it. The writer knows that he wants a scene in which our heroes are cornered by robots with smiley faces, knowing that if they themselves stop smiling, they will be instantly reduced to a skeleton. But he really can't think of any plausible reason for this scenario to have come about. The Doctor goes through three progressively less convincing theories about how the Big Dumb Object works. “The robots have built the city and are waiting for the colonists” works. “The robots have built the city and then wiped out all the colonists” also works. “The robots built the city and then wiped out some of the colonists but there are some spares in cold storage” feels like multiplying hypothesis. In fact, the solution turns out to be, “The Doctor does a thing and the bad thing goes away.” He is actually said, on screen, to have “switched the robots off and switched them on again.” (Since we aren't talking about a software glitch, but robots following their programming too literally, it's hard to see how this would help.) The presence of the Doctor makes everything all right; there is no need for any story-internal explanation. Douglas Adams famously got round the improbability of some of the events in the Hitch-Hikers Guide to the Galaxy by giving his heroes a space ship which caused improbable things to happen wherever they went. Cottrell-Boyce gets round the problem of not being able to think of an ending for his story by having the Doctor recite a version of the “three wishes” fairy tale. You know, the one where the silly farmer has to use his third wish to undo the results of the first two? In the Doctor’s version, the third wish is “I wish I had never made the first two wishes”. The solution to all life's problems is for the Doctor to press the re-set button. In case we miss the point, the Doctor's version of the fairy tale is called "the magic haddock". This is as clear and deliberate a signal as I can imagine that the writer is perfectly aware he is writing but really can't think of anything better. I am actually coming around to the idea that what needs to happen is that the programme which is now calling itself Doctor who needs to be cancelled again. For good this time. The longer it goes on, the farther up itself it gets: at this point it is basically fan fiction about itself. I can't really say any way out of this beyond a total re-setting (turning it off and on again, if you will); but that was tried several times and failed (remember when the Doctor wiped all knowledge of himself from the universe, so he could go back to being just a wanderer in a box? Remember how long that stuck? Less than an episode, wasn't it?). It should be put out of its misery and the resources put into something new. Obviously I have to disagree with SK. Trouble is, I am not 100% on what grounds. Part of the problem is that so many plots have been done -- after all, 50 years is a long time -- so repetition becomes very hard to avoid. But the story that this one is a repeat of was so very good that Smile could only look weak in comparison. You will recall that the last time civilisation was threatened by well-meaning nanobots that wanted to make everything right but instead killed them, the setting was resonant, the acting was convincing, and the resolution was that Nancy accepted that, yes, she was his mummy -- a genuinely affecting moment that actually gave us a resolution that made perfect sense in the context of the science-fictional premise. It may still be my favourite single Doctor Who story. Smile had an awful lot of work to do to top that, and its solution to that was to not even try. The reset-button conclusion was just awful, an abdication. It really did reduce the episode to The Doctor And New Clara Run Around For A While And Then Hit A Button. Perhaps what the series needs is not to be put down forever (contra SK) but another good, long break -- like the McCoy-to-Eccleston break -- so that whoever comes in to run it next does so from a genuinely clean slate as RTD did. Or maybe what it needs is Matt Smith. I was worried I might end up agreeing with SK too. It's not that that has never happened before, but every time it does I believe it causes Brigadoon to appear. I can see the logic of both break and cancellation, but perhaps even the break isn't strictly necessary. It just needs the kind of new broom 'hard reset' it had when it first came back, an entirely new creative team with an entirely new agenda. One thing in it's favour is there not being (at least yet) an absurdly convoluted backstory to follow. When it's (largely) a series of standalone, it's less hoisted by it's own petard and more something you might watch at Saturday teatime. In the old days it would recycle stories again and again, but when it was less a bold new drama and media event that seemed less of a problem.